Aluminum Nitride (AlN), a covalently-bonded ceramic, is synthesized from the abundant elements aluminum and nitrogen. It does not occur naturally. AlN is stable in inert atmospheres at temperatures over 2000°C. It exhibits high thermal conductivity but is, uniquely, a strong dielectric. This unusual combination of properties makes AlN a critical advanced material for many future applications in optics, lighting, electronics and renewable energy. 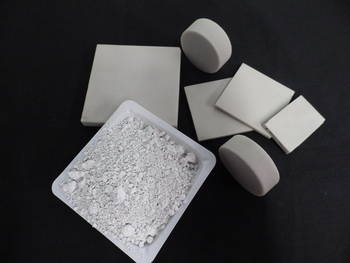 Surmet is the only US-based supplier with the ability to synthesize tonnage quantities of high quality AlN powder, or to fabricate sintered AlN components in complex shapes for electronic and industrial customers. Surmet's Buffalo, NY facility has been a leading supplier of high purity AlN to international customers for over 20 years. In addition to powder production, Surmet is capable of producing and supplying sintered AlN products. To meet the growing demand for thermal management, Surmet is developing copper metalized Aluminum Nitride tapes, net-shaped complex 3D structures and composites. Advanced products such as AlN micro-channel reactors and AlN substrates with novel embedded metallic structures are under development. Chemically stable up to 980°C in H2 and CO2 atmospheres, and in air up to 1380°C (surface oxidation occurs around 780°C; the surface layer protects the bulk up to 1380°C). Multiple grades (produced through both direct nitridation and carbothermal reduction methods) available for competitive cost for various applications. Suitable for tape-casting, sintering, hot pressing or as thermally conductive fillers in polymers. Compositionally homogenous for high thermal conductivity. Water-resistant "WR" grade of powders available. Aluminum Nitride (AlN) is a unique ceramic material that combines high thermal conductivity with high electrical resistivity. Only a few ceramics possess high thermal conductivity: Beryllium Oxide (BeO) and cubic Boron Nitride (c-BN) are virtually the only other examples. However, the use of BeO is restricted due to its toxicity, and c-BN is very difficult to produce. "Thermal conductivity" is the ability of a material to transport heat when subjected to a temperature gradient. In dielectrics like AlN, heat is transferred through lattice vibrations (also known as "phonons"). Materials with simple structure, covalent bonding and low atomic mass generally possess high thermal conductivity. The actual thermal conductivity of a material is affected by factors that hinder phonon propagation. Temperature, impurities, pore size and distribution, grain size, compositional homogeneity and orientation all affect the lattice vibrations, and therefore thermal conductivity. The theoretical thermal conductivity of AlN is about 280 Wm-1K-1. The actual thermal conductivity depends on processing conditions and raw material purity. The presence of oxygen impurities in the lattice is a major detriment; as oxygen displaces nitrogen in the lattice it creaes vacancies that interrupt phonon propagation and scatter the phonons, thus reducing thermal conductivity. Surmet in the only US-based producer of AlN, and has expertise in powder processing procedures required to yield high purity AlN with excellent thermal properties. Intrinsic (single crystals) thermal conductivities (Wm-1K-1) of various materials.